This stamp's image displays the words 'First Class' in red letters with a blue 1st class icon, perfect for sending out large batches of mail. The image's size is 45 x 17 mm. 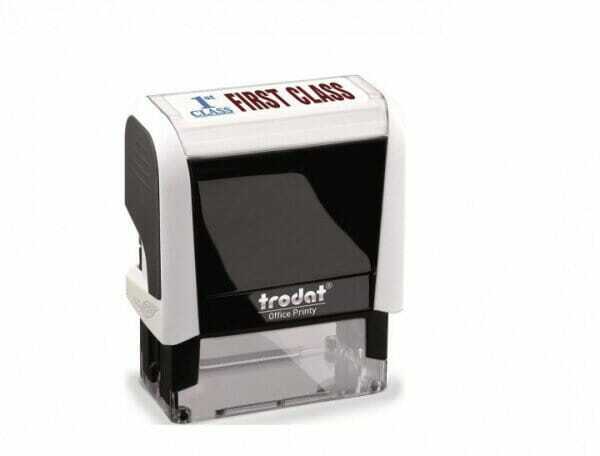 The stamp, Trodat's Printy 4912, is a self-inking rubber stamp, which means that no separate ink-pad is required. Being one of Trodat's bestsellers, the stamp is climate-neutral: with 70% of recycled plastic. Customer evaluation for "Trodat Office Printy - First class"